Cristiano Ronaldo is selling his cars as he prepares to move to Madrid, the latest for sale is his Porsche 911 convertible. 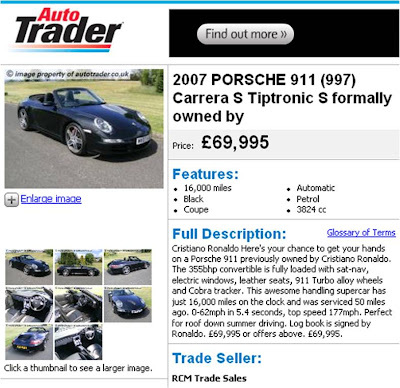 However, rather than doing it quietly, the Carrera 2 Tiptronic S is being sold through the Autotrader website and is being advertised using his name and implied endorsement. The car has the usual specifications listed, but the ad starts with the phrase 'Here's your chance to get your hands on a Porsche 911 previously owned by Cristiano Ronaldo' and the buyer of the Ronaldo Porsche will also inherit a log book signed by Cristiano Ronaldo. See the Autotrader Ronaldo Porsche ad for yourself here. The Ronaldo Porsche listing has been featured in national press today (see the Telegraph here) as well as highlighted on the Autotrader news section here - in turn this has created conversation and given free publicity to both the listing and the Autotrader site. The Ronaldo Porsche listing is another example of how a stunt or newsworthy event can be amplified (and given scale / additional attention) through social media.